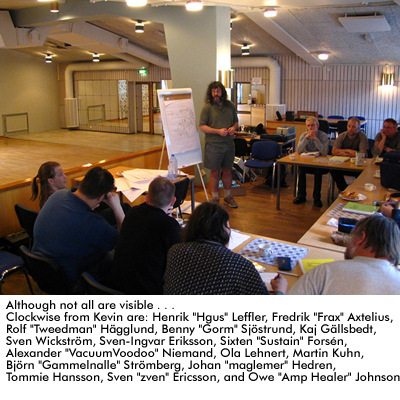 After the great fun everyone had at the 2003 workshop, many participants told us they'd like to have us back in 2004 for another workshop. We were very pleased!! 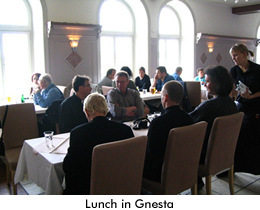 Since we enjoyed our last trip to Sweden so much, we were more than happy to make plans for another event. 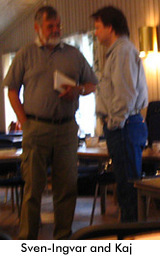 Once again, our friend Owe Johnson made many of the arrangements. 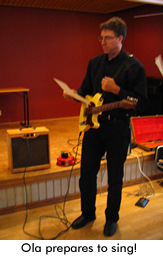 Martin Kuhn found us a nice hall at the Elektron Folketshus not far from Stockholm. 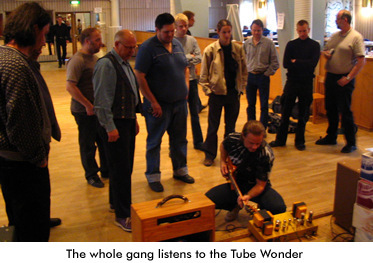 The workshop was advertised in FUZZ Magazine and through the GMF Rörtipsplank (a Swedish tube amp newsgroup). 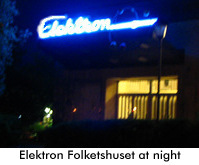 We all converged on the Elektron Folketshus on May 29, a beautiful time to be in Sweden among such great folks! 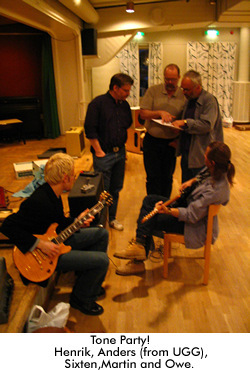 This year's workshop was based upon the material in our newest book: The Ultimate Tone Vol. 5: Tone Capture...specifically, Chapter One, which deals with preamp design and voicing, with optimizing gain structures, and with repeatable methods for adjusting high-gain circuits. 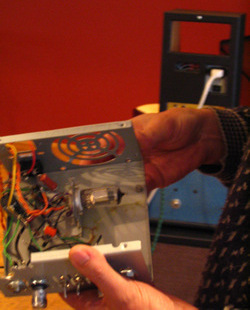 The discussion naturally led to the techniques used in Trainwreck amps, Soldanos, and other brands of interest to the group. Although some of last year's participants could not make it to this workshop, we were pleased to see some new faces from the GMF newsgroup and elsewhere, and, as always, part of the fun of this workshop is to meet folks we've only encountered in cyberspace. 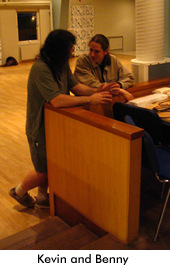 We believe the cyberterm for this kind of face-to-face contact is "IRL" (in real life). 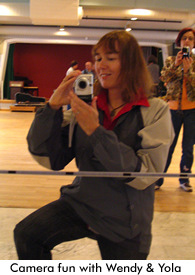 So, our workshop gives the GMF an "IRL" side. It's good to know that none of the members or projects we've seen on the GMF are fakes, (like the moon-landing...). 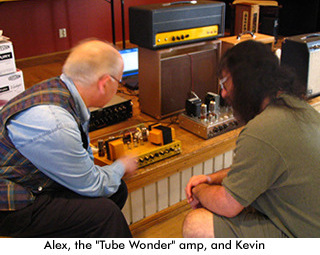 After lunch Kevin continued the discussion started in the morning, covering the interaction of the preamp and the power amp, Power Scaling, tube protection, and other points brought up by the group for discussion. 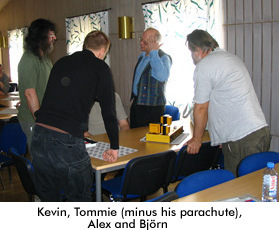 The mood was relaxed, with lots of dialogue between the group and Kevin. 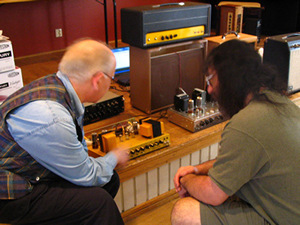 At about 4pm the lecturing was over, and it was time to show off amp projects! 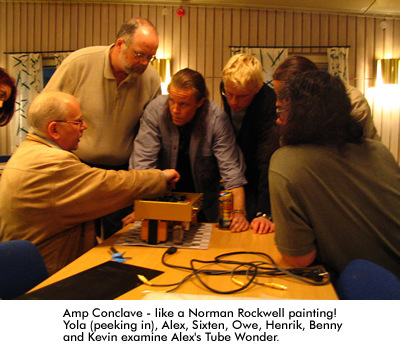 We were all treated to an impressive array of home-built amplifiers. Not everyone brought projects, but below are some of the highlights of those we saw. 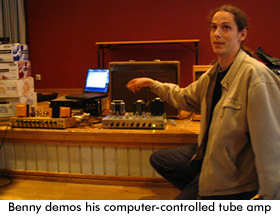 Benny demonstrated his computer-controlled tube amp, in which the computer monitors each tube's idle condition, the tube balance, and assures a delay of the application of plate supply. 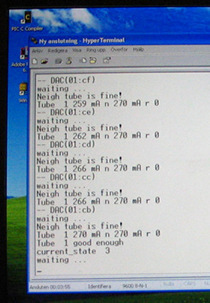 There are simpler, but far less entertaining ways to do this! Thanks Benny! 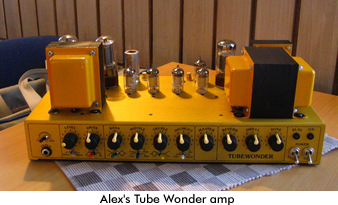 Alex's Tube Wonder amp was the most photogenic of the group! We loved the yellow! 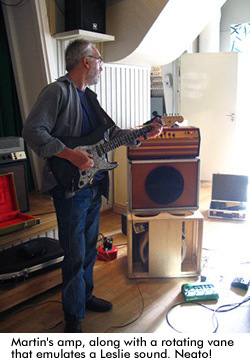 The amp features custom transformers, PCBs designed by Alex, active-EQ (usually found on mixing consoles), and silk-screened panels. And did we say we liked the yellow...? 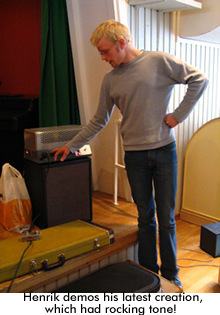 Johan brought along a tube amp that sounded good and had a unique construction that allowed easy viewing of all the "interesting stuff". Reminiscent of the "works-in-a-drawer" televisions by RCA. 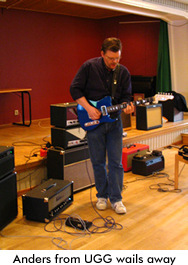 Sixten presented his "Edgar D-Lux" amp, and all were impressed by its clear, rich tone. It certainly looked nice, too! 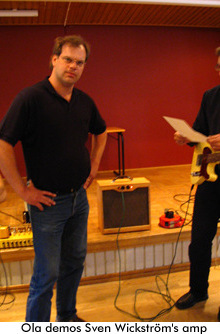 Sixten produces amps that follow vintage approaches, but he offers the choice of either octal or miniature tubes by installing both sets of sockets in the amp. 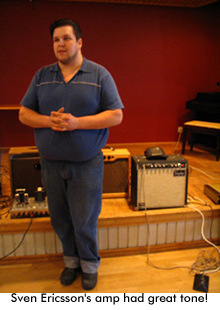 This allows the player to choose how "tweedy" the amp should sound. 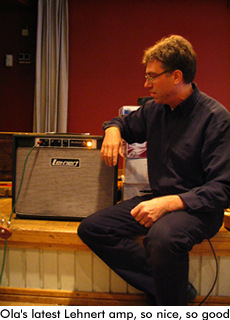 Martin showed off his amp to good effect with his usual virtuoso playing. 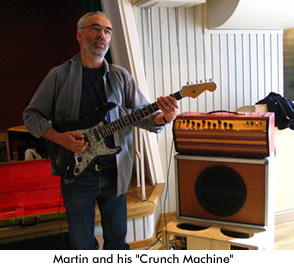 He had converted last year's "Martin Kuhn Clean Machine" into this year's "Martin Kuhn Crunch Machine". 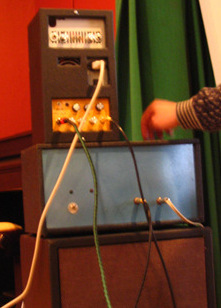 Part of his setup this year was a rotating vane (at bottom), which emulates a Leslie speaker cabinet. 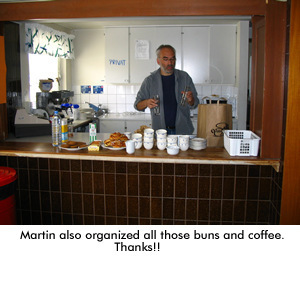 Thanks also to Martin for organizing the venue and for making coffee! 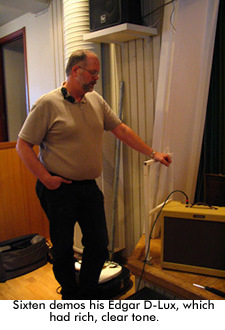 Sven used an EF86 tube in the front-end to capture some of the "vintage-Vox" tone in his simple but well-tuned amp. 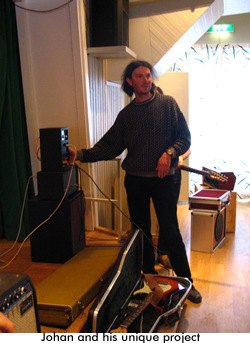 After bringing the smallest amp to the workshop last year (the punk-rock amp in radio dress), this year Henrik brought his modified PA chassis set up for raunchy blues tones. 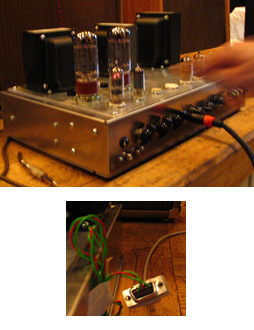 Sven's been working on this amp for a long time, and it shows! 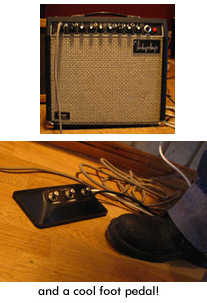 The amp is effectively a three-channel, highly portable gigging box, and it sounded great! 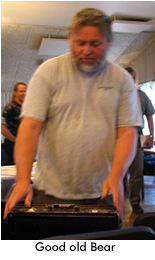 Ola brought a prototype Lehnert amp, designed for real players. 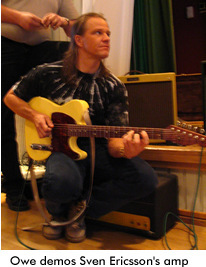 Four controls allow access to clean and distorted sounds, with effective EQ-ing. 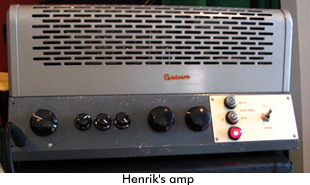 The amp is voiced to complement the speaker, which is in a partially detuned cabinet. 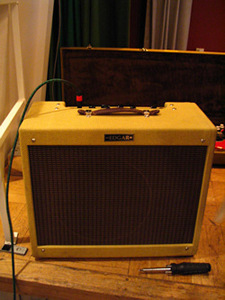 An elegant amp, just like its builder! 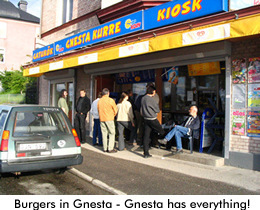 At suppertime some of us went up the road to this little grill, for health food! 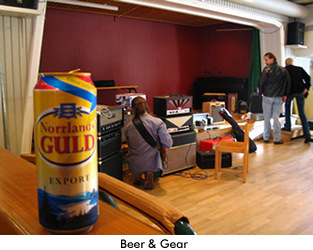 After the Workshop and the "GMF Amp Party", the gang from Ultimate Guitar Gear (UGG) brought in gear (and beer!) for their "Tone Party". 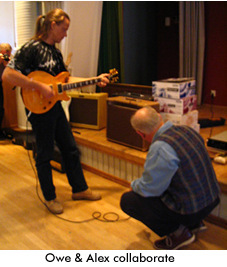 Various boutique amps were available to try out, including a couple of Komet amps, a Mystic amp, and vintage Marshalls. 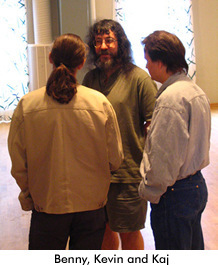 Meanwhile, workshop participants also chatted about their projects, and collaborated on ideas. and the hospitality of those who put us up (and put up with us!) in their homes. See other Workshop Reports here! Visit our "What's With All This Swedish Stuff?" page!